As discussed in the Tajima post, after midnight can be a ghost town when it comes to trying to find a place to eat in San Diego that doesn’t end in –berto’s or –in-the-box. Here’s a (non-exhaustive) list of interesting spots around town with kitchens open past midnight. Alchemy, South Park. 1am. Great food and drink menu emphasizing local/seasonal fare. Late night happy hour nightly 10pm-close. 3rd Corner, Ocean Beach, Encinitas. 1am, tues-sun. Owned by Ed Moore, the original owner of the (much missed) Thee Bungalow Restaurant, this is a wine shop that also happens to have bistro food. The Tractor Room, Hillcrest. 1am fri-sat, 12am sun. Lots of game meat and “creative” cocktails, as well as the (self-proclaimed) largest bourbon, rye, scotch, and whiskey selection in town. West Coast Tavern, North Park. 2am. Set in a historic building (built in 1929) and attached to the lovely recently restored Birch North Park Theater. Great daily deals, including happy hours, Wednesday bourbon night, and drinks & a movie in the Birch theater. Red Fox Room, North Park. 2am. Maybe not the best steaks in the world, but you must go here at least once for a late night steak dinner with garlic toast and fried shrimp – This place is small, red, dark; full of aging North Park octogenarians and young(ish) whippersnappers, with a tiny bar and an equally tiny piano lounge. Truly, it’s a unique and relatively little-known piece of Old Hollywood in San Diego that can’t be duplicated once its doors finally close for good. Tajima Japanese Noodle House, Convoy. 3am thurs-sat. Cheap, hot, fast and open until 3 am. What else is there to say? (plenty, apparently). Brian’s American Eatery, Hillcrest. Open 24 hours fri/sat. Diner food that’s not that cheap and not always even that good, but hey, it’s 24 hours and the people-watching can’t be beat. Studio Diner, Kearny Mesa. 24/7. Traditional diner sitting on the lot of a working movie and TV studio in Kearny Mesa (What? Yep, there is a studio lot smack in the middle of Kearny Mesa. Who knew?). 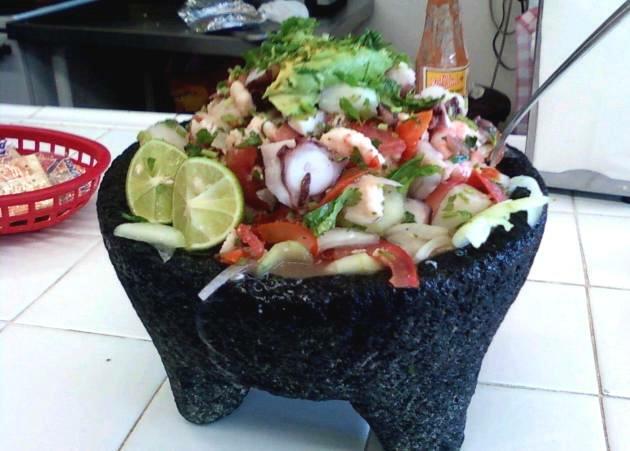 It’s a Taco Shop – Point Loma. 24/7. Yes, there are a million 24/7 taco joints in San Diego. Yes, this is a building that looks like a giant yellow and red cheese wheel. And yes, not everything here is stellar. But please do yourself a favor and order the carnitas tacos some late night – hot, greasy delicious mounds of pork, a bit of pico and a bit of guac, and lots of hot sauce. Thank you, sir, may I have another? Feel free to add your favorite after-hours place in the comments. Is there anything more satisfying than delicious, greasy, post-bar, late night restaurant adventuring? The biggest challenge in San Diego can be actually finding a place that’s open (assuming you’ve had your fill of Denny’s, Jack in the Box, and [fill-in-the-blank]-berto’s). Although we’ve done a lot of growing up in the last few years, San Diego still retains some sleepy little town feel when it comes to kitchens still serving after midnight. At Tajima, the setup is simple – small, close-together tables (expect a line at “bar-thirty”), and a short menu emphasizing ramen and a few Japanese tapas-style dishes (the main focus at the Izakaya Tajima location down the street). To order ramen at Tajima, you first select your ramen type: Regular (BBQ pork & egg), Spicy (spicy ground pork & egg), Vegetable (vegetables, pork & egg), Extra BBQ (extra pork & egg), Kakuni (pork belly & egg), Mabo Tofu (tofu, ground pork, egg), or Asari (asari clam & egg). From there, choose either thin or fat noodles and soup flavor (soy sauce, salt, miso, tonkotsu). We ordered a bowl of regular tonkotsu ramen with fat noodles to share. Because we were pathetically starving, we also ordered Tonpei (grilled pork with egg) and Ikasugata (grilled squid) to share from the a la cart menu. The tonpei and ikasugata were the first to arrive. I love the ikasugata and always end up ordering it at either Tajima location. I think I keep ordering the tonpei and forgetting that I don’t really like it – menu description and presentation look interesting, but it ultimately just tastes like ham and eggs in mayonnaise to me. It’s certainly edible (pathetically starving, remember? ), but I wish I’d ordered the Tan Shio instead. If you go to either location, I really do recommend trying the tan shio. Yes, it is beef tongue, but it has a kind of beefy bacon flavor and comes with green onions and a nostril-clearing spicy mustard – delicious – it’s honestly probably the best post-bar tongue you’ll get that night. I kid, I kid! Besides, isn’t our motto to be adventurous and try new things, especially delicious ones? Hooray, it is! The ramen comes out quickly and is topped with chashu (simmered pork), nori, negi (green onion), and hanjuku tamajo, a sort of halfway hard-boiled egg with a firm white and semi-l iquid yolk that’s been steeped in a soy sauce marinade. The noodles definitely have a lot of chew to them – ramen noodles are typically expected to have some bite to them and some people think they are undercooked or “hard” – you can try to order yours soft or “yawarakame” if you like them less firm. 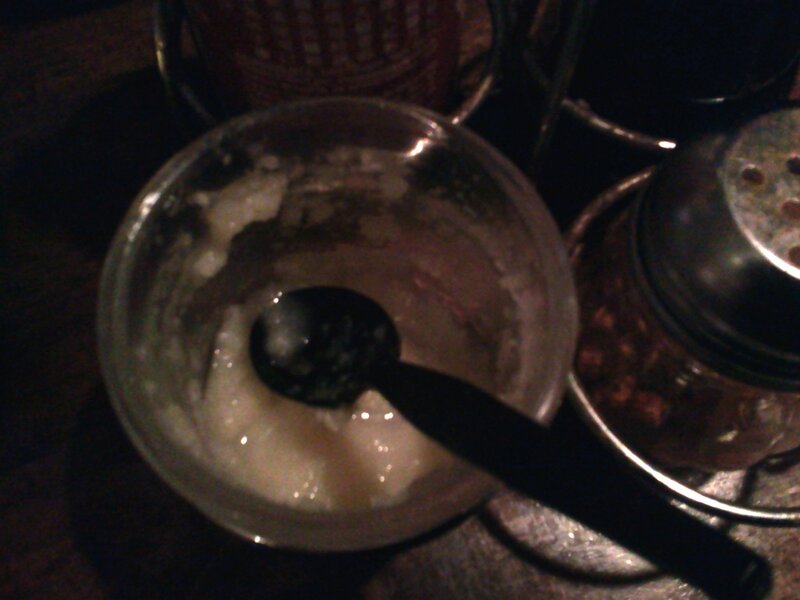 I like to add a big scoop (or two) of ninniku-dare (garlic paste) from the condiment tubs on the side of the table. Hooray garlic! Grand total for ramen, squid, tonpei, and tea? Just over $20. 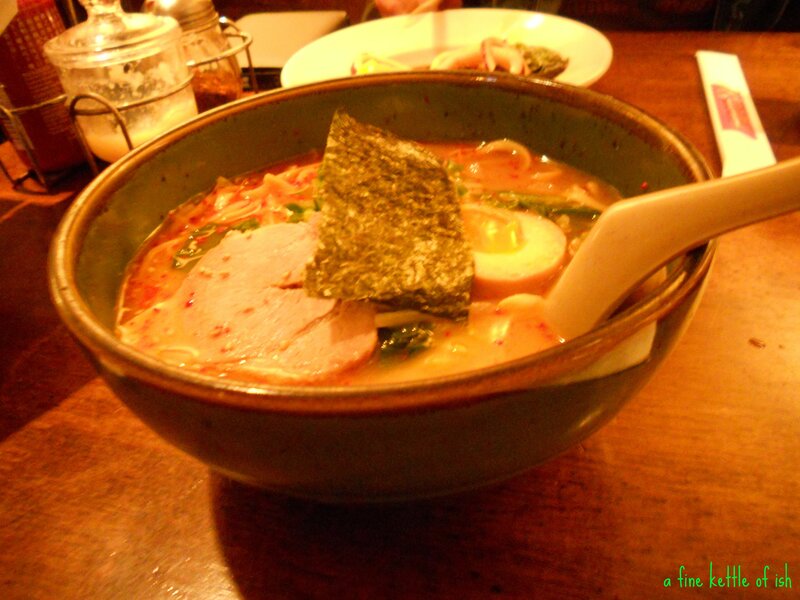 With nearly 200 places in San Diego selling ramen, is Tajima the best ramenya in town? Is it authentic? I can’t claim to have the expertise to really answer either question. I can, however, vouch for it being a pretty darn good choice for cheap 2 am eats, whether or not Tampopo is in your Netflix queue. Tajima Japanese Noodle House, 4681 Convoy St., San Diego, CA 92111 (858)576-7244, open lunch, dinner, and late night (thurs-sat 10:30pm-3am). Want to know more about ramen? Check out Ramenate, Ramen Adventures, or Serious Eats for ramen eating in Japan and beyond, mmm-yoso for what’s what in San Diego ramen, or RAMENRAMENRAMEN to brush up on your ramen terminology. Ramen not your proverbial cup of tea? Still recovering from the Great Ramen Eating Contest of 2010? 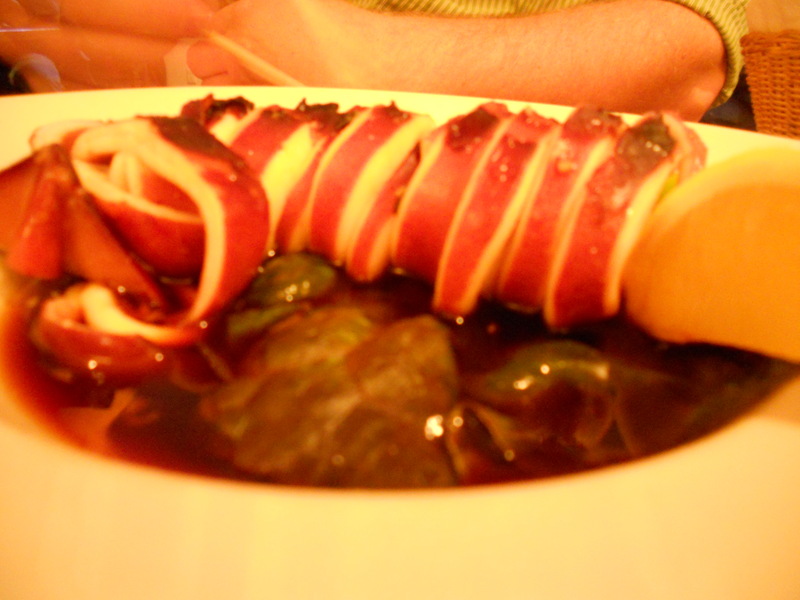 Stayed tuned for an upcoming post on eating after midnight in San Diego!